1. Plan of the staircase executed by Bramante in that part of the Palace of the Vatican called the Belvedere. 2. Section of the same; the staircase is composed of a continuous inclined plane making five revolutions, supported by columns, the order of each changes at each revolution, commencing with the Tuscan and terminating with the composite. 7-8. Profile and face of the spiral cornice. 9. Façade of the house built by Bramante in 1513, for Raphael d'Urbino, in the Strada di Borgo-nuovo, near St. Peter's. This house was demolished at the time of the construction of the colonnade in front of this church; it is here engraved from a work entitled Pallazzi de Roma de' piu celebri Architetti, disegnati da Pietro Ferrerio, book i, p. xv. 10-11. Portion of ground floor and general plan of the arch of a vast edifice, commenced by Bramante in the Strada Giulia in Rome, but left incomplete in consequence of the death of Pope Julius II. 12, 13, 19. Plan of the ground floor, transverse section and elevation of the principal front of the Palace of the Cancelleria, erected in Rome by Bramante in 1495. 14-15. Doric columns, in granite, supporting the arches of the ground and first floor of the court. 16. Capital of the Doric column, no. 15. 17. Profile of the entablatures over the arches of the ground and first floor of the court. 18. Base, capital, and entablature of the composite order of the upper story of the court. 20-21. 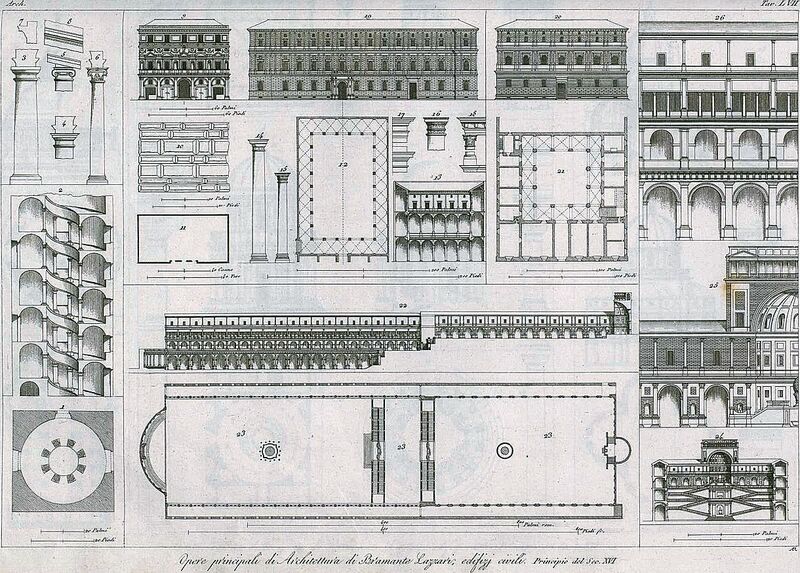 Façade and ground plan of the palace, built by Bramante in 1504, at Rome, for the Cardinal Adrian de Corneto. 22-24. Longitudinal section, general plan, and transverse section of the court of the Belvedere of the Vatican, represented as it was designed and partly executed by Bramante in 1503, during the pontificate of Julius II. The court was afterwards divided by an edifice which Sixtus V erected for the library of the Vatican. 25. Elevation of the portion of the end of the court on a larger scale, showing the great niche. 26. Part of the longitudinal section on a larger scale, showing the detail of the orders which decorate the four stories of this court.